The New Horizons team – including hundreds of technicians, engineers, scientists, managers, educators and communications specialists from more than 20 institutions across the country – has been given the NASA Group Achievement Award for creating and launching the first mission to Pluto and the Kuiper Belt. NASA Planetary Science Division Director James Green made the presentation Sept. 11 at the Johns Hopkins Applied Physics Lab in Laurel, Md., where New Horizons was designed and built, and is now operated. APL also manages the mission for NASA’s Science Mission Directorate; John Sommerer, acting head of the Lab’s Space Department, accepted the award on behalf of the many APL staff members who developed the mission and spacecraft. 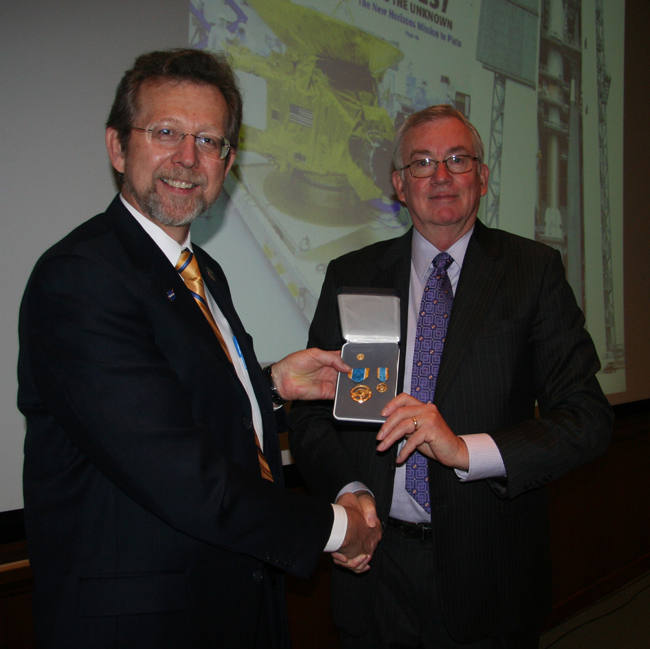 Green also presented the NASA Public Service Medal to Glen Fountain, the New Horizons project manager at APL, for his exceptional leadership and guidance of the mission. After an open competition, NASA awarded the mission to Principal Investigator Alan Stern’s team (which included APL) in late 2001; then, just four years after formal design work began, New Horizons lifted off from Cape Canaveral Air Force Station, Fla., on Jan. 19, 2006. 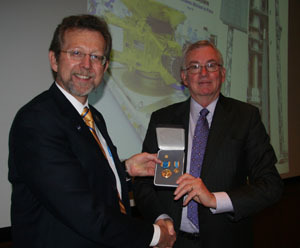 In a ceremony at the Johns Hopkins University Applied Physics Lab (APL) in Laurel, Md., NASA Planetary Science Division Director James Green (left) presents the NASA Public Service Medal to Glen Fountain, the New Horizons project manager from APL, for Fountain’s exceptional leadership and guidance during development of the first mission and spacecraft to Pluto.